(Nanowerk News) Every electrical device, from a simple lightbulb to the latest microchips, is enabled by the movement of electrical charge, or current. The nascent field of ‘spintronics’ taps into a different electronic attribute, an intrinsic quantum property known as spin, and may yield devices that operate on the basis of spin-transport. Atom-optical lattice systems offer a clean, well-controlled way to study the manipulation and movement of spins because researchers can create particle configurations analogous to crystalline order in materials. JQI (Joint Quantum Institute) and CMTC (Condensed Matter Theory Center) theorists Xiaopeng Li, Stefan Natu, and Sankar Das Sarma, in collaboration with Arun Paramekanti from the University of Toronto, have been developing a model for what happens when ultracold atomic spins are trapped in an optical lattice structure with a “double-valley” feature, where the repeating unit resembles the letter “W”. This new theory result, recently published in the multidisciplinary journal Nature Communications ("Chiral magnetism and spontaneous spin Hall effect of interacting Bose superfluids"), opens up a novel path for generating what’s known as the spin Hall effect, an important example of spin-transport. Behavior in double-valley lattices has previously been studied for a collection of atoms that all have the same value of spin. In this new work, theorists consider two-component atoms--here, the spin state each atom has can vary between “spin-up” and “spin-down” states. Atomic spins in a lattice can be thought of as an array of tiny bar magnets. In the single-component case, the atom-magnets are all oriented the same direction in the lattice. 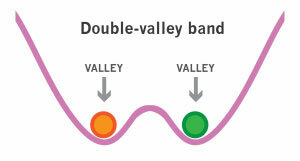 In this case, the magnets can have a tendency to favor only one of the wells of the double-valley. In the two-component system studied here, each atom-magnet can have its’ north-pole pointed either up or down, with respect to a particular magnetic field. Adding this kind of freedom to the model leads to some very curious behavior – the atoms spontaneously separate, with the spin-up atoms collecting into one well of the double-valley, and spin-down atoms in the other. 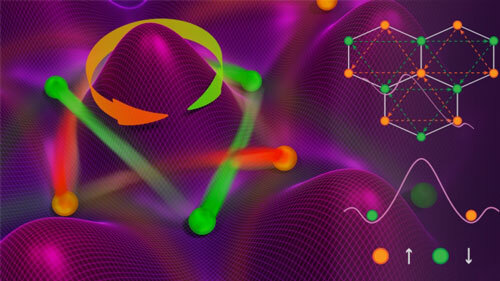 Theorists have dubbed this new state a “spontaneous chiral spin superfluid”. This sort of spin-dependent organization is of great interest to researchers, who could employ it to study the spin Hall effect, analogous to the Hall effect for electrons. Normally, this effect is seen as a result of spin-orbit coupling, or the association of an atom’s spin with its motion. In fact, this has long been the approach for producing a spin Hall effect – apply a current to material with spin-orbit coupling, and the spins will gather at the edges according to their orientation. Ian Spielman’s group at the JQI has pioneered laser-based methods for realizing both spin-orbit coupling and the spin Hall effect phenomenon in ultracold atomic gases. In contrast, for the superfluid studied here, spin-sorting is not the result of an applied field or asymmetric feature of the system, but rather emerges spontaneously. It turns out this behavior is driven by tiny, random quantum fluctuations, in a paradoxical phenomenon known as quantum order by disorder. Generally speaking, the transition from disorder to order is a familiar one. Consider water condensing into ice: this is a disordered system, a liquid, transitioning to a more ordered one, a solid. This phase transformation happens because the molecules become limited in their degrees of freedom, or the ability to move in different ways. Conversely, adding noise to a system, such as heating an ice cube, generally leads to a more disordered state, a pool of water. Amazingly, noise or fluctuations in a system can sometimes drive a system into a more ordered state. The theory team showed that this is indeed the case for certain kinds of atoms loaded into a double-valley optical lattice. While this system is a quiet, mostly non-thermal environment, noise still lurks in the form of quantum mechanical fluctuations. In this system, the spin-up and spin-down atoms can potentially be configured in four different, but energetically identical arrangements. This is known as degeneracy and can be indicative of the amount of order in a system--the more equal energy states, the more disordered a system. It turns out that these arrangements have different amounts of quantum noise and these fluctuations play a crucial role. Surprisingly, the quantum fluctuations will break up the degeneracy, thus restoring order. What’s the upshot? In this system, the resulting lowest energy configuration--a chiral spin superfluid-- is preferred independent of the type of double-valley lattice geometry, indicating a type of universal behavior. With this in mind, the theorists examine a number of lattice structures where this phenomenon might be realized. For instance, if the fluid is placed into a hexagonal lattice configuration, similar to the structure of graphene, they expect the characteristic spin currents of the spin Hall effect to emerge, as depicted in the graphic, above. In the publication, the team points out that optical lattice systems are a flexible, pristine platform for examining the effect of these tiny variations in quantum fluctuations, which are often masked in real materials. Outside of exploring novel forms of matter like the one found here, research into spin and atom manipulation has applications in emerging electronic-like technologies, such as spintronics, valleytronics and atomtronics.